Jurie Mentz, our Vryheid Development Co-ordinator, interviewed Themba Congwane for this issue of Pula Imvula. Themba’s love for farming started when he was little, as he grew up on a farm and his dream is to become a better farmer and plans to achieve this by acquiring knowledge and working hard to achieve his goals. Currently I farm on 186 hectares on a farm which I acquired through the land reform process. I started by planting a few hectares of maize and expanded as my knowledge increased over time. 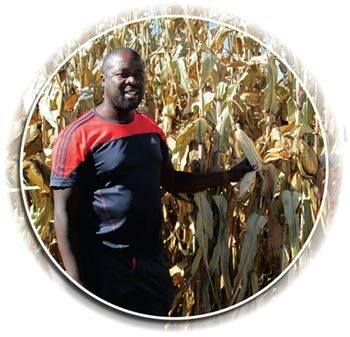 The past season I planted 60 hectares of maize and I am planning to plant about 90 hectares of crops this coming season. I am planning to plant soybeans in the upcoming season for crop rotation and a bit of maize. We also have 2 000 layers on the farm and have a herd of 30 cattle. What motivates me the most is when I look around and see the commercial farmers. I would really like to become one of them. My biggest motivator was Mr David Gooseberg who was appointed by AFGRI and was my first mentor. One has to push hard and work hard on a farm and set goals for yourself. Strengths: My biggest strength is my family who supports me all the time and that I am committed to what I would like to achieve. I also believe in learning and training, as technology is changing all the time. One must upgrade oneself through training to become a better farmer. Weakness: My biggest weakness is that I am impatient and that perhaps I would like to grow my farming enterprise too fast. My very first maize crop yielded 4 tons/ha and this year despite being very dry and challenging I managed to get 7,8 ton of maize/ha. This I believe was achieved by planting early or at the right time and by being on my farm every day. I do believe in hands on approach and good maintenance of my equipment before the season starts. I continue looking for information to better myself and my farming and I am not scared to ask my commercial neighbours on how to do something. I have completed the Introduction to Maize, Advanced Maize, Soybean, Farming for Profit and On-farm Maintenance courses so far but would really like to learn more about no-till, engine repair and other training in order to better myself. In five years time I would love have a bigger farmer – maybe planting double the amount of fields with better equipment and tractors. I would also like to better my yields. Then I would love to help with social responsibility by transferring my knowledge to other farmers in my area. My advice to young aspiring farmers is that they should be patient, acquire knowledge and work very hard at achieving their goals. I would like to encourage them to never give up on their dreams and set themselves achievable goals and to remember farming is a long-term goal. Article submitted by Jurie Mentz, Development Co-ordinator of the Grain SA Farmer Development Programme, Vryheid. For more information, send an email to jurie@grainsa.co.za.